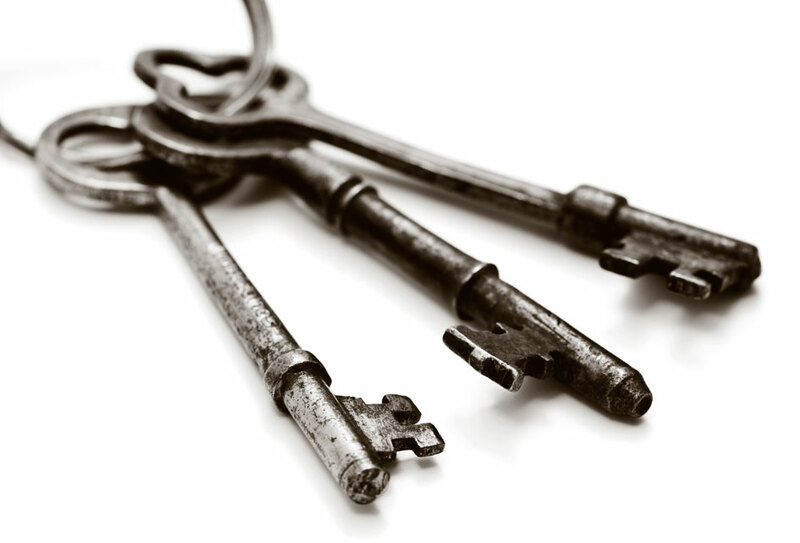 That's it - those are the three keys! Sounds too easy doesn't it? If you can learn how to master those three concepts - then you can tutor any class, any age and not only meet the requirements but enjoy your class and better yet, your class will enjoy you! So let me explain each one for you. If you know all CC cycles without error, masterfully execute all science experiments, teach presentations skills without pause, play tin whistle like an angel and whip together the best review games, and have not classroom management - you are a clanging symbol! Clarify expectations with parents and the children. Ensure everyone knows what is expected of them and what you will be expecting of yourself before the year starts. 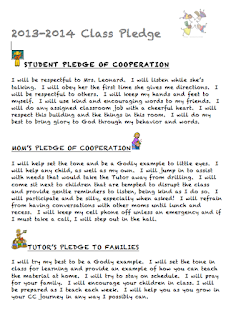 Sending out a class pledge in your introduction e-mail to all your parents is a good way to start. Then covering your rules again in class the first day is a great way to start out the year right. Cover your rules repeatedly during the first 4 weeks of the school year. You have extra time due to the absence of six weeks of review material - use it to establish your class and set the expectation. Have a catch phrase for the students that sums up your rules for them to remember. Mine was OBEDIENCE=FUN. I used that phrase because every kid knows what "obedience" looks like, for the most part. 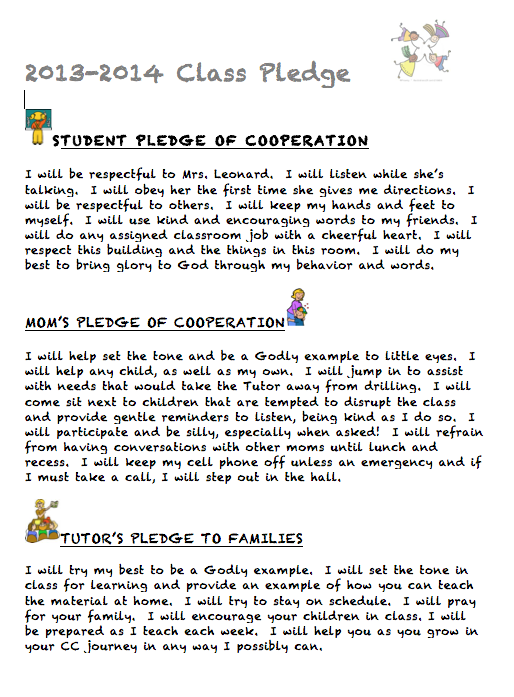 Then we would go around class and clarify what it looks like to be obedient (Keeping hands to yourself, Not talking when someone else is, being respectful to adults and classmates with our words and actions, etc.). The kids knew that we would play games, throw silly balls and have a good time as long as they all listened, and participated. If they didn't, they all knew the consequences - boring drills with no props or movement. Be prepared to carry out your consequences a time or two, and make sure you DO! Inevitably you will have that one child that wants to test out the "rules". Make sure you follow through and don't give grace the first several weeks of class when a rule is broken. It's much easier to be strict and loosen up as the year goes on, then to start out too lax and try to tighten things up - it doesn't work very well and requires a lot more effort! Present DO NOT Teach! 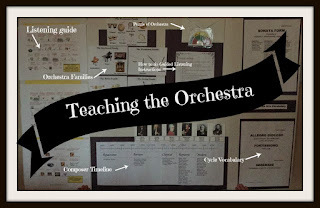 Use fun, easy, no plan props to facilitate fun memorization. Don't bring in materials that require: teaching, explanation, or set up and other complicated, time consuming aspects. Silly balls, voice changers, silly cubes, ball catchers, marching, chanting, etc. 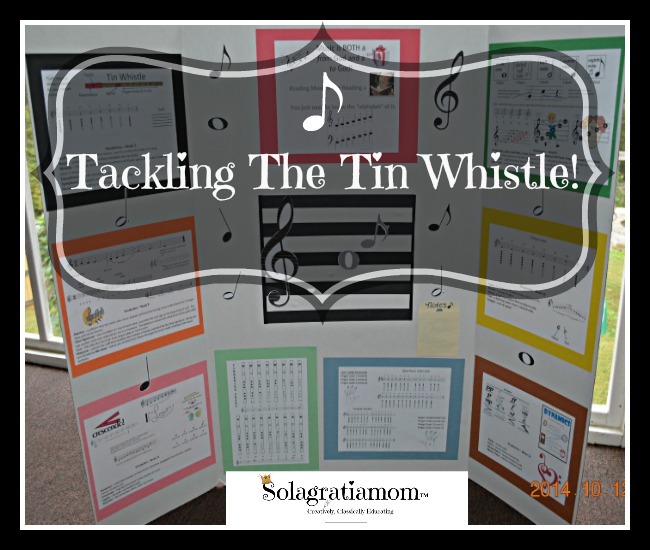 are the ways to move through quickly and have the kids enjoy their time while memorizing. Put together a toolbox of tools you can use repeatedly through the year to cover the new grammar and write them all down on a list. Carry the list with you, and the tools each week. Know the Material! If you don't know the material ahead of time and you are fumbling to find a location, figure out an experiment or quickly scan what you should know about a fine art lesson - you will come across as unprepared and it will take away from the time you have to get to it! Parents expect you to know the material since they are paying you. So while you don't need to have it memorized, you should know what material you are covering and familiarize yourself in advance with anything you aren't sure about - like finding the geography locations ahead of time. The science and fine arts are the two areas you do need to do some preparation each week - but it shouldn't consume more than an hour of your week to have these down for class. Drill Sergeant! Keep everyone on pace. If a child wants to tell the class all about something they just thought of regarding the history sentence, then kindly cut them off and let them know we'd all love to hear about it at lunch time and move forward. Same goes for parents. Don't let students or parents hijack your class. If a parent interjects during an activity and it's appropriate, then go with it, but not if it's in the middle of new grammar drilling. Know when you have time to give grace and when you don't, in order to keep your class on track. Model Questions in younger grades for presentations! Kids when they aren't at the dialectic stage or entering that phase, just don't know how to ask good questions I have found, and instead it becomes a conversation about what fuzzy animals they have at home too or how many times they went to disneyland and what all their favorite activities there were as well. Don't let that happen. Set the tone from the first presentation, letting the classes below Journeyman would be my suggestion, know that you or Moms will be asking one or two questions per presentation to model for them good questions to ask. I always found it a time stealer to let the kids ask questions in the younger grades and while I'm all for dialectic discussion and asking questions, it really isn't beneficial to the kids to hear "I liked your speaking voice" 18 times by the time presentations have concluded. So set yourself free in that area of time management. Make productive use of your time in class and model what good questions are when it comes to the younger kids. Stick to the 3 minute MAX per presentation if you have a full class of 8 students, because you have to account for questions, and the getting up and sitting back down of each student. Otherwise, you will run over time. Funny feeling balls, textured balls, squishy balls, gel filled balls, funny looking balls or anything that a kid would be drawn to pick up and play with works! Silly cubes - are available at CC online or you can make your own with a blank template. Voice changers - kids think its so silly to hear each other manipulate their voices as they chant through the memory work. Balls in cup game to drill. List of easy to play games like the telephone game, hot and cold, marching around the room changing leaders, etc. Things that require no prep and you can use for any weeks memory work are best. Science hand motions from CC connected - download them - it's worth it. They are easy to do and intuitive for memorizing the science each week. Use the CC Connected hand motions for timeline if you are going to do hand motions. They are much more simplified then the youtube version going around. Find review games that again, require not much or no prep. My favorites are rock, paper, scissors, war, crocodile dentist and Memory Mogul. Find many more easy ideas here. 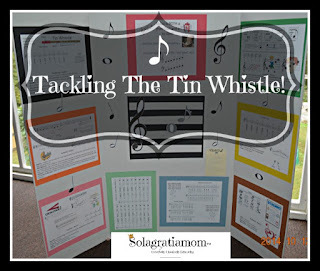 Make tri-fold boards for teaching the fine arts and tin whistle to keep you on track and put everything you need at your fingertips visually for the class. So be an excellent tutor by managing your class, managing your time and sticking to simplicity. 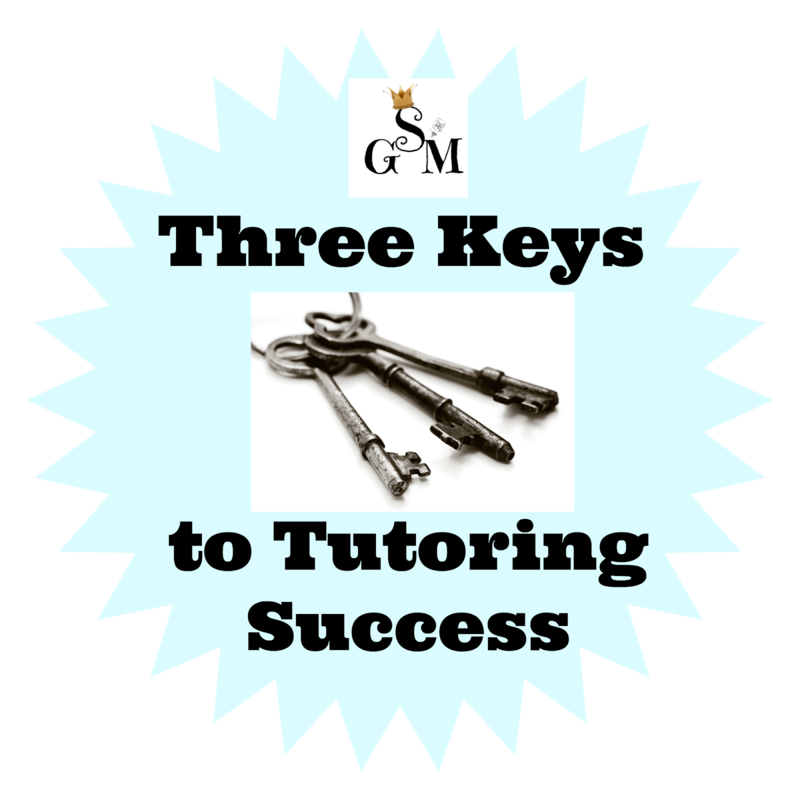 It will make your job as a tutor much more manageable, your kids will enjoy their class and your parents will feel you have done a great job. It's not about creativity (and believe me, I was tempted when I first started tutoring to bring all sorts of creative ideas into it -but also wasted lots of precious hours of my time). 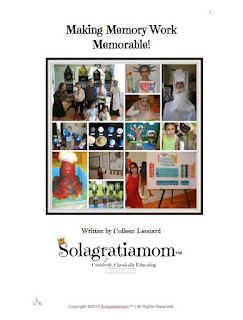 It's about crisp segments, presenting material, modeling for the Moms how to quickly do review at home in less than 30 minutes a day, and loving on kids. That's pretty easy to do once you get the hang of it! Colleen - I loved reading this! It was wonderful. You write so on topic and so on point. I am excited to begin tutoring. Thank you for everything!